Here you will find both general information about domestic and cross-border payments as well as detailed information about OeNB payment services currently in use and the introduction of new payment instruments and services. As of February 1, 2014, all domestic and cross-border euro payments in SEPA must be made using the new credit transfer form containing the IBAN and BIC rather than the account number plus the Austrian Bank Code. 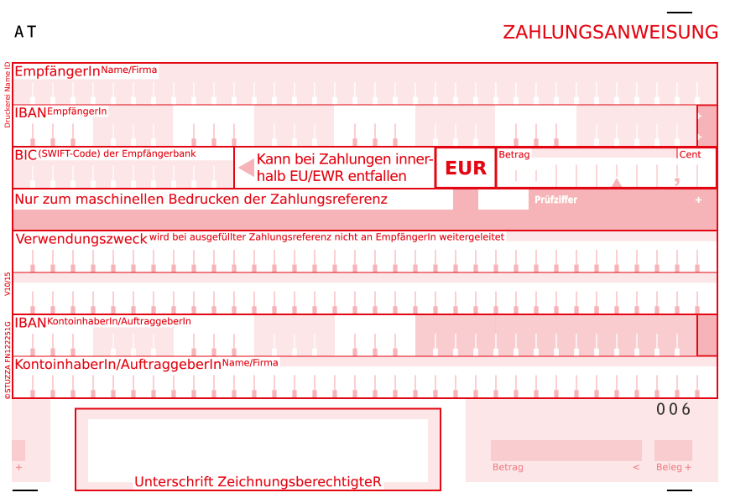 The credit transfer form (Zahlungsanweisung) will completely replace the forms currently in use (Zahlschein, Erlagschein, Überweisung and the EU standard transfer). Since February 1, 2016, customers are no longer obliged to state the BIC for cross-border payment transactions in Euro within the European Economic Area.